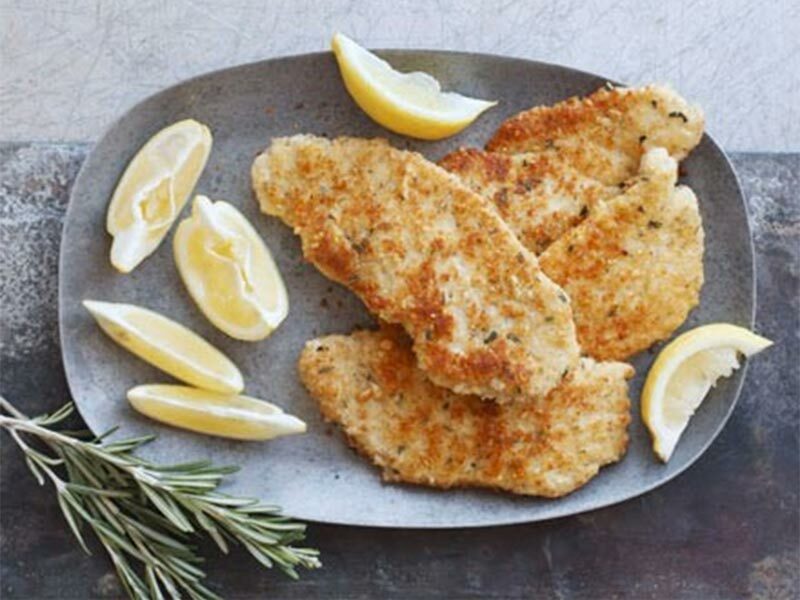 Grilled or pan fried pork leg steaks can disappoint but cut them in half, cover with cling film, and beat them out with a rolling pin into a 3mm escalope and they make an admirable substitute for veal in Wiener schnitzel. They are even better coated with Parmesan breadcrumbs and fried in a mixture of sunflower and olive oil. Cold, they make great finger food fro picnics and buffets – all they need is a slice of lemon. If you have any cheese and breadcrumbs left, freeze them for next time. 1Mix the breadcrumbs and Parmesan together and season (go easy on the salt). Pour the oil into a deep frying pan to a depth of 2cm (you don’t want the escalopes to sit too heavily on the base of the pan or the coating will catch and come off). Heat the oil to frying temperature (approx 170°C). 2Dip the escallops in the egg, then the parmesan breadcrumbs and lower gently into the oil. Fry for a couple of minutes, then turn over and repeat. Shake off the excess oil and dry on kitchen towel. Serve with lemon wedges and plain basmati rice. 3Allow the oil to cool and pour through kitchen paper or a coffee filter. You can re-bottle and reuse it several times.